Honey is healthy for you. Tea is healthy for you. Vegetables are healthy for you. We are constantly hearing how something is “healthy” for us but we hardly ever hear how exactly they are healthy for us. What do these “healthy” things actually do? What is the research behind these claims ? Has it been tested in real life scenarios? Of course, keep drinking your tea and don’t forget to add a little bit of lemon to that tea. It’s all great and wonderful but I believe that marketers needs to think about spending some of their ad budgets on letting the masses know exactly why these things are so good for us instead of simply saying “Hey, see! This is healthy for you!”. (Disclaimer : the information shared in this article should not be taken as personal medical advice. Please see your family physician or dermatologist for any skin-related health issues you might have). Now that we have a mutual understanding, let’s take a look at the effect of honey on your skin. In 1998, researchers studied the effect of using a honey dressing (yep, they took some wound dressing and doused it in honey) on burn wounds in comparison with the standard hospital dressing that had silver sulfadiazine (SSD). By the seventh day, 80% of the honey-treated wounds showed signs of improved healing (reduced inflammation and general signs of wound repair under a microscope) as compared with 52% of SSD-treated burn wounds. Within 3 weeks, 100% of the burn wounds treated with honey were fully healed compared with 84% of the burn patients who had been treated with the standard pharmaceutical SSD dressing. A 16% difference is nothing is scoff at. Another group showed similar results in the healing of pressure ulcers (a kind of wound people get simply from laying in bed for a long period of time. Usually these wounds are so severe that healing can be very difficult.). In this study, the group of pressure ulcer patients treated with honey had a 56% reduction in ulcer size in 5 weeks compared to 13% reduction of ulcer size in the control group. Bottomline : Honey is phenomenal at healing wounds. Whether you believe in scientific research or not, the findings of the groups I just referenced above cannot be dismissed as a fluke. Honey was used as far back as in the time of the Egyptian Pharaohs for it’s healing properties. Modern researchers have just taken it a step further using the tools we currently have available to us to conduct meaningful research. Honey can prevent the growth of close to 100 species of bacteria including one the kinds of bacteria that are usually present in wounds. 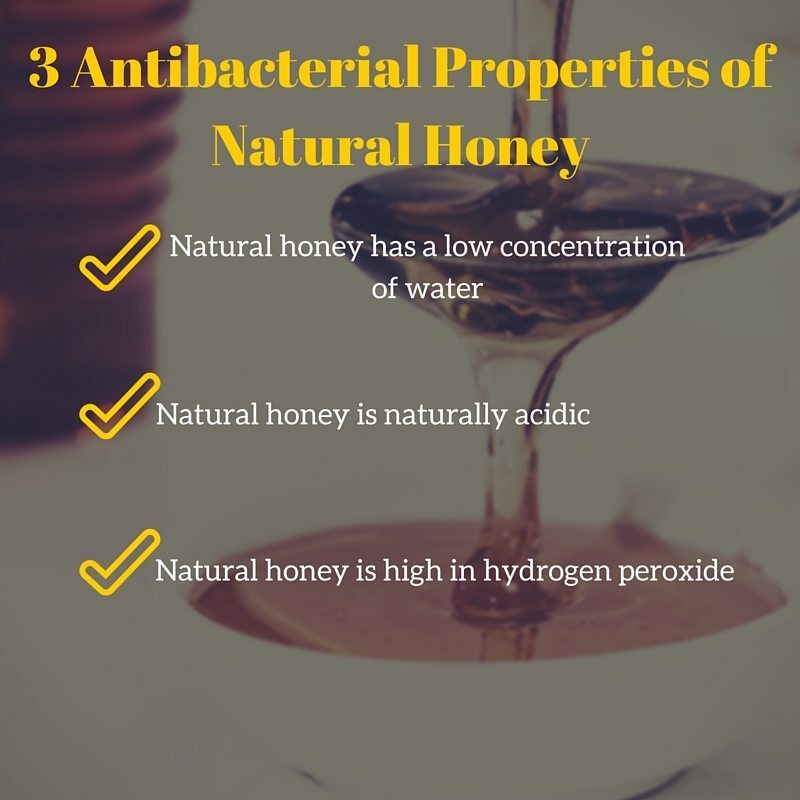 Natural honey achieves this effect by having very little water content (scientists call this a high osmolarity) , it’s large hydrogen peroxide content and the fact that it is highly acidic. You might have seen hydrogen peroxide at your local CVS pharmacy or Rite Aid. It is quite common to find hydrogen peroxide in first aid kits where it is used as a disinfectant for wounds. Well if you are getting your honey raw and with minimal processing, you have yourself a natural disinfectant that also speeds up wound healing ! Most bacteria cannot tolerate acidic environments. Hence honey’s high acidity prevents bacterial growth through this property alone. I know , I know ! That’s a big word – epithelialization. No need to get scared. Epithelial cells are the cells that make up the outer portion of our skin. When we get hurt, the production of epithelial cells is what eventually occurs so that our skin returns to normal even if it is with some scarring. There is some evidence that suggests the natural honey may encourage/speed up the production of these cells which in effect allows wounds to heal faster. So while I strongly encourage you to seek medical attention for all your health concerns, the next time you get hurt at home and you have a jar of raw/natural honey (this may not happen with the over-processed brands of honey out there) sitting on your shelf, try applying it to your skin for a few days. Have you ever tried honey at home as a healing agent ? Let me know if you have. NOTE : D-TEK Live Bee Removal has 100% raw honey for purchase during most of the year. Check it out here for more details. Barbosa NS & Kalaaji AN (2014) CAM Use in Dermatology. Is there a potential role for honey, tea and vitamin C ? Complementary Ther Clin Pract. Ajibola et al(2012) Nutraceutical values of natural honey and its contribution to human health and wealth. Nutrition &Metabolism.